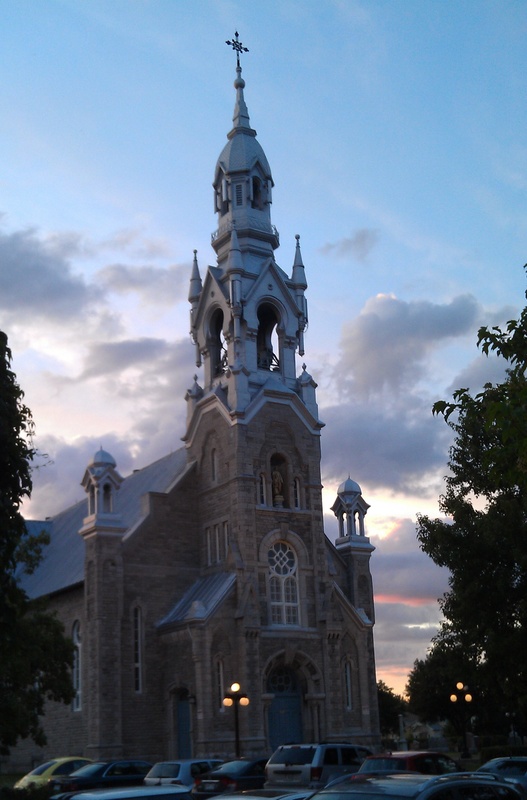 With the start of a new month, the Lois McClure entered Beloeil, a town who’s name translates to beautiful eye. Living up to its name, the town was truly scenic, located directly across the Richelieu River from Mont St. Helaire, the only mountain for miles. This seeming unnatural land formation dominates the sky to the east, towering over the surrounding flatlands. After traveling through the infamous “Bridge of Death”, nicknamed due to a horrific train accident involving an open bridge, rail cars full of immigrants, and a tow of canal boats in the early 1900s, without incident and docking at the public dock of Beloeil, the crew of the Lois McClure went about the usual docking procedure except this time we had to rig a special contraption because the concrete dock was almost even with the bulwarks of the Lois. Then came all of the panels, accompanied by the ever present debate of where they should be positioned and which order would work best. One of our local contacts, the Beloeil Tourist Information Center , generously allowed the crew to use the rental bikes for free. So shortly after the boat closed, Tom and I decided to use two of the bikes to explore the town. Unfortunately for our sense of speed, the bikes the tires were slightly flat. As we didn’t want to end up damaging them, we decided to go find some air. After walking for what felt like forever with the two bikes, we located a gas station with an air compressor. However, the use of said compressor cost money and neither of us had thought to bring any kind of cash with us. There was another bicyclist there in the same situation as us – flat tire, no cash. Luckily for us he had called a friend to bring him a some change so that he could pump his tires and he quickly offered us the extra time on the compressor. It’s kindness like this that makes visiting all the communities we see such a joy. With tires brimming with air, Tom and I pedaled back to the boat arriving just in time for dinner. We were open for one and a half days. The first half day brought out what seemed like the whole town with visitors lined up waiting to board before we opened. It was wonderful. Unfortunately the next day the weather stemmed the flow for a little while, but in the afternoon the visitors kept on coming. Early in the morning on the second day in Beloeil, a group of us prepared all of our shower stuff, because the local Fire Department had offered up their showers for the crew to use. In addition to the showers being available they also said they would taxi us to and from the fire station. Everyone was just expecting a van or maybe a SUV, but oh no, they were pulling out all the stops. Up pulled a full blown ladder truck! We were shocked. Personally, I had never been in a fire truck, so it was super awesome and everyone else seemed just as amazed. Also, being fireman they knew all about water, so it was no surprised that the showers were top of the line. I am always amazed at the kindness and adventure that happens around the Lois McClure. It is hard to imagine that there are new things for us to see out there because we have seen so much. However every town is still able to provide that wonderful little treasure that we will always remember and Beloeil is no exception.